Summary: A secular proverb says, “Bloom where you are planted.” It calls one to accept circumstances and do the best job possible at growing and thriving. However, it fails to take into account individual and corporate sinfulness. The Lord does no such thing. He plants us in life, in His Church, and desires us to produce abundant fruit. However, we are incapable of doing so on our own. Indeed, when He looks to sinners for sweet works of righteousness, He finds only the “wild grapes” of wickedness. Even our best deeds fail when they come from our own hearts and minds. Nevertheless, we don’t despair, for God’s Beloved — His own Son Jesus — produced the fruits that we cannot. He then took our punishment and was torn down by sinners and devoured by death and grave. Thus He did what we could not, paid for what we did, and finally rose to life in order to give new life and God-pleasing fruits to all who believe in Him. 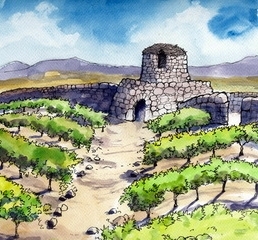 Text: Let me sing for my beloved my love song concerning his vineyard: My beloved had a vineyard on a very fertile hill. 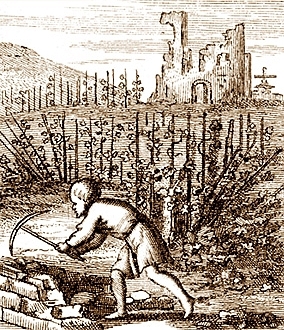 He dug it and cleared it of stones, and planted it with choice vines; he built a watchtower in the midst of it, and hewed out a wine vat in it; and he looked for it to yield grapes, but it yielded wild grapes. And now, O inhabitants of Jerusalem and men of Judah, judge between me and my vineyard. What more was there to do for my vineyard, that I have not done in it? When I looked for it to yield grapes, why did it yield wild grapes? Audio: Click to hear the MP3 of Song of Loss, Song of Love.